Corn, beans and chillies are the most well-known Mexican ingredients, and all have been part of the Mexican diet for thousands of years. Mexico was ruled by Spain for three hundred years - so the cuisine also features many Spanish influences, which include the introduction of sugar, cheese and livestock to the Mexican diet. Additionally, fruits and vegetables also form an important part of the Mexican diet - these include tomatoes, squash, sweet potatoes, coconut, pineapple, papya, avocado and prickly pear cactus. Chili con carne - A spicy stew (usually beef or pork) with chili peppers. 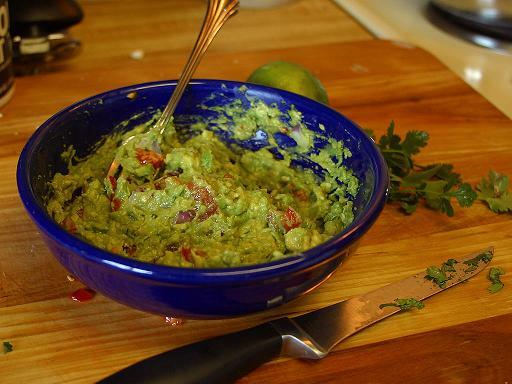 Guacamole - A dip/relish created using avocado, the recipe for which dates back to pre-Columbian times. As well as avocado, ingredients usually include tomatoes and salt, and sometimes lime juice, onions, and spices. 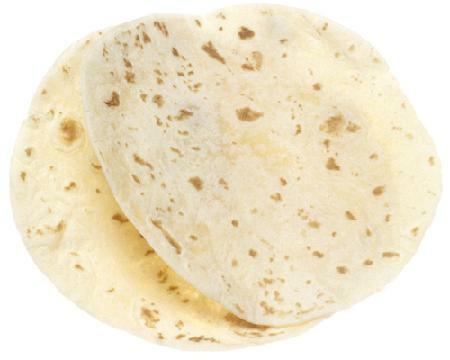 Tortilla - A flat unleavened bread made from ground maize (corn) or wheat flour. Burrito (also known as "taco de harina") - A tortilla filled with meat, such as beef, pork or chicken. Traditionally, meat is the only filling and the tortilla is rolled thin, however in the United States, it has become the norm to add other ingredients such as rice, beans, tomatoes, salsa, guacamole, cheese or sour cream. 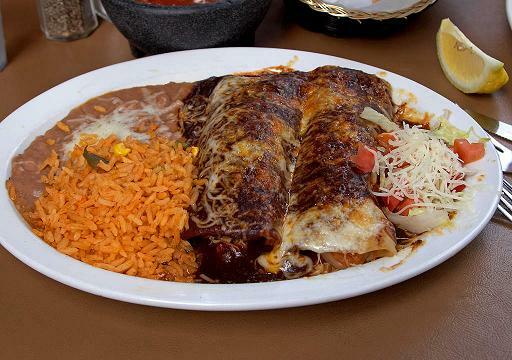 Enchilada - A maize (corn) tortilla dipped in oil or lard and then enchilada sauce. The tortilla is then filled, rolled, placed in a casserole dish and layered with sauce or other ingredients, and finally baked. 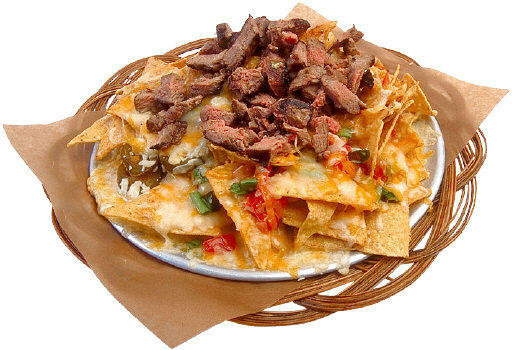 Nachos - This is a snackfood made by covering tortilla chips (crispy fried wedges made from corn tortillas), and covering them melted cheese or other toppings such as jalapeño peppers, onions, salsa, guacamole, beef or chili con carne. Collection of Classic and Traditional Recipes from Mexico! Enrique Olvera is a leading talent on the gastronomic stage, reinventing the cuisine of his native Mexico to global acclaim - yet his true passion is Mexican home cooking. In Tu Casa Mi Casa he shares 100 of the recipes close to his heart - the core collection of basic Mexican dishes - and encourages readers everywhere to incorporate traditional and contemporary Mexican tastes and ingredients into their recipe repertoire, no matter how far they live from Mexico. This book includes more than 100 sumptuous photographs of finished food and ingredients, including step-by-step photos to add ultimate clarity to the basics chapter. These authentic home-cooked recipes are beloved throughout Mexico and beyond - a genuine taste of the country and its traditional cuisine. Peter Meehan, award-winning food writer, Los Angeles Times editor, former New York Times food critic, and co-founder of Lucky Peach has written the foreword. Marcela Valladolid loves to entertain guests at her beautiful home in San Diego, and just as she did in Casa Marcela, this book captures the spirit of her hybrid Mexican-American upbringing in vibrant and mouthwatering recipes. Picadillo Lettuce Cups are topped with avocado and lime and make for perfect finger food; Spicy Chimichurri and Jalapeño-Cilantro Aioli are the perfect addition to a crudite platter; the classic panzanella salad is updated with tomatillos, panela cheese, and pork rinds; and vegetarian options include Chickpea Ceviche Tostadas and Sweet Potato Chipotle Hummus. Of course there are plenty of cocktails, too—Strawberry Basil Cardamom Margaritas, a Mexican-inspired Old-fashioned, Orange Cinnamon Sour, and the Kalimotxo, a red wine and Mexican Coke sangria. Inspired by the flavors, ingredients, and flair of culinary and cultural hotspot Mexico City, Gabriela Cámara's style of fresh-first, vegetable-forward, legume-loving, and seafood-centric Mexican cooking is a siren call to home cooks who crave authentic, on-trend recipes they can make with confidence and regularity. With 150 recipes for Basicos (basics), Desayunos (breakfasts), Primeros (starters), Platos Fuertos (mains), and Postres (sweets), Mexican food-lovers will find all the dishes they want to cook--from Chilaquiles Verdes to Chiles Rellenos and Flan de Cajeta--and will discover many sure-to-be favorites, such as her signature tuna tostadas. More than 150 arresting images capture the rich culture that infuses Cámara's food and a dozen essays detail the principles that distinguish her cooking, from why non-GMO corn matters to how everything can be a taco. With celebrated restaurants in Mexico City and San Francisco, Cámara is the most internationally recognized figure in Mexican cuisine, and her innovative, simple Mexican food is exactly what home cooks want to cook. A collection of 100 recipes for regional Mexican food from the popular San Francisco restaurant. The true spirit, roots, and flavors of regional Mexican cooking—from Puebla, Mexico City, Michoacán, the Yucatán, and beyond--come alive in this cookbook from Gonzalo Guzman, head chef at San Francisco restaurant Nopalito. Inspired by food straight from the sea and the land, Guzman transforms simple ingredients, such as masa and chiles, into bright and flavor-packed dishes. The book includes fundamental techniques of Mexican cuisine, insights into Mexican food and culture, and favorite recipes from Nopalito such as Crispy Red Quesadillas with Braised Pork and Pork Rinds; Toasted Corn with Crema, Ground Chile, and Queso Fresco; Tamales with Red Spiced Sunflower Seed Mole; and Salsa-Dipped Griddled Chorizo and Potato Sandwiches. Capped off by recipes for cocktails, aqua frescas, paletas, churros, and flan—Nopalito is your gateway to Mexico by way of California. This is a cookbook to be read, savored, and cooked from every night. The host of a highly popular PBS series, Pati’s Mexican Table, and a self-described “overloaded soccer mom with three kids and a powerful blender,” Pati Jinich has a mission. She’s out to prove that Mexican home cooking is quicker and far easier than most Americans think. Her dishes are not blanketed with cheese, or heavy and fried, or based on complex sauces. Nor are they necessarily highly spicy. Surprising in their simplicity and freshness, they incorporate produce and grains. Most important, they fit perfectly into an everyday family cooking schedule and use just a handful of ingredients, most of which are already in your pantry. Many are homey specialties that Pati learned from her mother and grandmother, some are creative spins on classics, while others are not well known outside of Mexico. Dishes like Chicken à la Trash (it’s delicious! ), a one-pot meal that Pati gleaned from a Mexican restaurant cook; Mexican Meatballs with Mint and Chipotle; Sweet and Salty Salmon; and Mexican-Style Pasta can revitalize your daily repertoire. You’ll find plenty of vegetarian fare, from Classic Avocado Soup, to Divorced Eggs (with red and green salsa), to Oaxaca-Style Mushroom and Cheese Quesadillas. Your friends and family will enjoy Tomato and Mozzarella Salad with Pickled Ancho Chile Vinaigrette; Crab Cakes with Jalapeño Aioli; and Chicken Tinga — (you can use rotisserie chicken), which makes a tasty filling for tortas and tostadas. Pati also shares exciting dishes for the holidays and other special occasions, including Mexican Thanksgiving Turkey with Chorizo, Pecan, Apple, and Corn Bread Stuffing; Spiral-Cut Beef Tenderloin; and Red Pozole (“a Mexican party in a bowl”), which she served on her wedding day. Desserts like Triple Orange Mexican Wedding Cookies, Scribble Cookies (sandwich cookies filled with chocolate), and little Apricot-Lime Glazed Mini Pound Cakes are sophisticated yet simple to make. The vibrant flavors of Mexican food are celebrated in this enticing collection of 75 fresh and authentic recipes for soups, tacos, burritos, tamales, beans, salsas, desserts, all ready in minutes, thanks to the Instant Pot's revolutionary cooking power. This complete guide to Mexican cooking with your Instant Pot is authored by Chef Deborah Schneider, a James Beard Award-nominated author and chef/owner of six Mexican restaurants, and includes all of her best tips and tricks, as well as the authentic dishes you'll want to make over and over again. Tex-Mex is more than just a flavor-packed cookbook of tried and true recipes for comfort-food favorites like nachos, fajitas, and chili—it’s a way of life. It was born in the 1940s when traditional Northern Mexican cuisine collided with the robust flavors of Texas ranchers’ kitchens. Now, chef and restaurateur Ford Fry presents the definitive book on the topic with craveable recipes that are heavy on flavor and light on fuss. Peppered throughout are jump-off-the-page photographs, helpful ingredient explainers, playful histories, and important cooking tips. These melty, crispy, hot-as-heck classics include Dirty Breakfast Tacos, Grilled Shrimp Diablo, Cheese Enchiladas Con Chili Gravy, Sopaipillas with Local Honey, and more salsas than you can imagine. Pour yourself a Classic Margarita on the Rocks—don’t forget to salt the rim—and get ready to satisfy the rumble in your stomach. The debut book from Mexico's best chef, Enrique Olvera of Pujol, pioneer of contemporary, authentic Mexican food and global gourmet influencer. As featured on Good Morning America. Enrique Olvera is the most famous and celebrated Mexican chef working today. Olvera's restaurant Pujol was ranked #1 in Mexico and #20 in the world at the World's 50 Best Restaurant Awards. This is his first book and the first ever high-end chef cookbook in English on Mexican cuisine. It captures and presents a new contemporary Mexican style of food, rooted in tradition but forward thinking in its modern approach. Olvera has pioneered and defined this new way of cooking and belongs to a global group of gourmet influencers that includes Noma's René Redzepi, Dom's Alex Attala, Osteria Francescana's Massimo Bottura and elBulli's legendary Ferran Adrià. –Over 65 recipes, each with an elegant photograph, from the sophisticated dishes served at Pujol to more accessible casual dishes that he enjoys with his family at home. –More than 100 atmospheric photographs capture the vivid mosaic of the Mexican landscape while tip-in pages bring the reader up close to Enrique's vision and philosophy about food. Mexico from the Inside Out is the latest addition to Phaidon's bestselling and influential collection of cookbooks by the world's most exciting chefs.